The Developing vs Developed Investigation worksheet is geared toward allowing students to investigate the differences between the developed and developing world. As such, students use both the Gapminder website and the CIA World Factbook to make inferences about what countries are more developed than others. 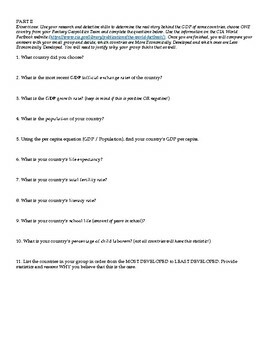 Terms such as: GDP, GDP per capita, life expectancy, GDP growth rate, population, total fertility rate, literacy rate, school life, and child laborers are used throughout the worksheet in effort of allowing students to investigate how these terms work with identifying countries! The download is a ZIP FILE and consists of both the PDF and an editable Word Document!